The Accelerated Life Testing module of AWB provides the functionality to analyze accelerated failure data and predict reliability characteristics under normal use conditions. 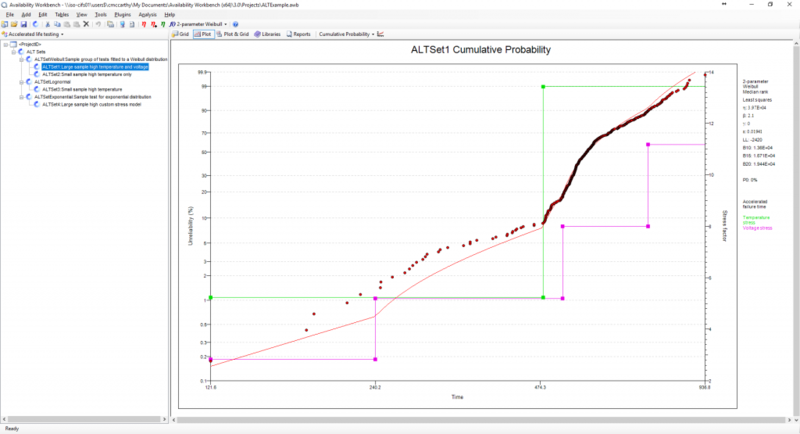 The Accelerated Life Testing module allows data sets to be analyzed using a proportional hazards or accelerated failure time survival model. Standard stress profile models are provided (Arrhenius, Eyring and Power Law) together with the ability to define custom models. Constant, time-varying and multiple stress profiles may be specified for a single data set. The Accelerated Life Testing module of AWB fits stressed data to exponential, Weibull, lognormal and normal distributions. Calculated parameters are produced in the form of the distribution parameters at use stress, B life and P parameter values and distribution plots (reliability, failure rate and pdf). A typical ALT module screen display. The left window displays ALT sets in the project tree control. The top right window displays a stressed Weibull plot with calculated Weibull parameters at use stress. The bottom right window displays times to failure and other input parameters.